A National Literature? Keynote by: Marlon James. 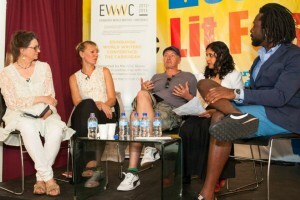 Panelists : Irvine Welsh, Hannah Lowe and Vahni Capildeo, moderated by Marina Warner. The debate on national literature at the Bocas Lit Fest was opened by Marlon James’ keynote address in which he spoke against the idea of “a single story” and the homogenising tendencies that might be implicit in attempts to define a national literature. James’ speech was predominantly concerned with Caribbean literature, exploring the dangers of prescription, and in particular whose voices might be excluded. In the case of Jamaica, he cited the popular and institutional homophobia that might alienate queer texts from the national agenda as one example of the exclusionary practices of nation building through literature. James was not entirely opposed to the idea of a national literature, but insisted that for it to exist it must itself be uneasy with the term ‘national literature’ and distrust it. The other speakers, including myself, had different but overlapping perspectives, all of us concerned with the ways in which the defining of national literature in the Caribbean and elsewhere (in my case England) might exclude. We discussed how particular voices have been submerged in national literatures – those of women, the working classes and minority groups. We also emphasised the plurality created by diaspora. In the 21st Century, the nation does not necessarily concur with geographic nation space. The Jamaica of my mind, for instance, was formed in Ilford, Essex and Brixton, London. Marina Warner chaired the event brilliantly after the opening introductions, asking whether the Caribbean nation might in some way be defined not be geographical space, but by a shared language, within the Caribbean and across its diaspora. There was some agreement, but again the emphasis fell on plurality with audience members reminding us that there is no one Caribbean creole, only creoles. Oonya Kempadoo, argued that creole languages have still not been embraced as national and are still referred to as dialects, a fact that doesn’t allow for the status of creoles to rise. Irvine Welsh pointed out that culture is always contested, by governments, community groups and writers themselves and indeed, I imagined that this debate over a national literature at Bocas would be a contentious one. In fact, there seemed to be lots of agreement in the audience, which was by and large composed of writers and critics. Our panel’s apparent dismissal of national literature was challenged by Pankaj Mishra who reminded the room that national literature has once been a kind of “aspiration” and asked whether anything might be harnessed or retrieved from the national. Similarly Richard Drayton urged us to remember how important Caribbean nationalism had been in the formation of a Caribbean literary canon. Yet, still, I didn’t hear any voices raised in strident demand of national literature – if they were there, they didn’t speak up. Another audience member spoke about the rehabilitative work of writers such as Chinua Achebe and Ngugi Wa Thiong’o in reconstructing events in colonial history from the African viewpoint, asking whether writers should feel a responsibility to record or retrieve history? This led into interesting responses about whether writers should feel any responsibility about their writing and its relationship to the nation, Irvine Welsh arguing “you write what you write”. He felt that there’s a danger in making writers too self-conscious about their work, something I agree with strongly. I know about literary critical and theoretical ideas, but these don’t guide my hand in writing. Afterwards, in reading, I might recognise them, but this, I would argue, is the remit of the critical reader. Likewise, relating to the broader debate, ideas about national literature and the nation might well be imposed on texts, not by writers, but by readers and critics. Surely a writer shouldn’t be expected to write nationally, or to necessarily be an expert on the nation. Other questions arose about the nation vs the region, something I feel strongly about. Chick, my poetry collection, which reconstructs my Jamaican father’s life in England, couldn’t have come from anywhere but England, but its London and Essex that are the lynch pins. I’m interested in how other nations might be found in those regions – the Indian and Pakistani nations in Essex or the Caribbean nation in Brixton for example. If there are to be national themes, the transnational has to be one of them and the idea of a homogenous, fixed national culture must be turned on its head. The view of readers matters as much as the view of writers, and it might have been good to have heard more from that perspective – to have had a reader or critic on the panel. The idea of a national literature was by and large dismissed from the perspective of the panel and our own agency emphasised when we defended our freedom not to assert national literature. I believe that the inclusive approach that I would demand from a national literature, at least in England (a place I feel I can speak about) would push the defining brackets so far wide it would be pointless to have them. And here I return to a question raised in the debate – why do the various forces (state sponsored, educational, market-driven or individual) continue to want to investigate the question of a national literature? Check out a photo gallery of the event here. Hi Hannah, Great post! Good to hear you and to spend time. For me, the question of ‘national literature’ flagged up how ‘national’ needn’t refer to birth and also needn’t slide into ‘nationalism’. The Caribbean, with its University of the West Indies campuses in 3 different islands, and its long history of inter-island conversations, is naturally transnational — but also, importantly, regional. As a writer I’m very interested in embeddness, pyschogeography, change of space over time, witness, etc. and so would like to recuperate authenticity and some complex, imaginative forms of localism (while not falling for sincerity, and while always enjoying play). As a human being concerned with literature in society, I said, and felt, that the question of ‘a national literature?’ also refers to readers; to the accessibility of texts. How can a literature be (or not-be) ‘national) unless there is the infrastructure (transport links, bookshops, literacy programmes) to circulate texts…or is this implicitly a question pitched at the international market level? Thanks again for the conversation. Enjoyed EWWC and hope to connect again soon. Vahni (Capildeo). P.S. Sorry about the typos! ‘Embeddedness’, of course. Also the need for people to find their world sufficiently reflected in the literature they can access, and the great imaginative challenges to new lit….cf. Rushdie, _Imaginary Worlds_, etc.